Average, well drained soil. Match your choice of tree fruits to local climate and soil conditions. All are winter hardy, but cold tolerance and chilling requirements vary with species. 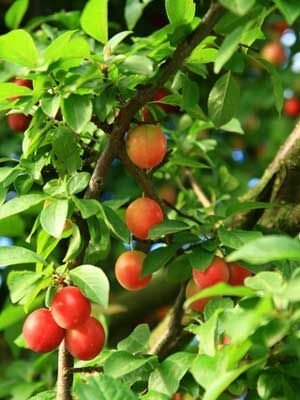 Choose regionally-adapted tree fruits, for example cherries in the north or peaches in the south. Purchase dormant plants and set them out in early spring. Water thoroughly and mulch after planting new fruits. Obtain local expertise before choosing which fruits to grow. University-based breeding programs have developed many great-tasting, disease-resistant varieties. Thin out fruit four weeks after the tree has blossomed and prune the tree in late fall. You can add a variety of this tree to label what it is and specify spacing or planting times. Protect the trunks of young trees from borers and sunscald with loose tree wrapping.